DON’T JUST DREAM ABOUT HAVING HOT BASIL PESTO CHEESE BISCUITS FROM THE OVEN, MAKE THEM RIGHT NOW. Baking Christmas morning is not out of the question for me especially for these Basil Pesto Cheese Biscuits. I always like to find a balance between sweet and savoury foods to make for holiday celebrations such as Christmas and New Years Eve. This year I’ve decided to add something new to the menu that your guests can enjoy as a snack, for breakfast or used as a dunking vessel. They are also great to GIVE. Each year I look forward to creating Christmas baskets for the teachers at my children’s school stuffing them with homemade goodies that I work on for months before the holidays. I believe that many people would rather enjoy something to eat than something they will never use. The Christmas baskets this year include perogies, biscotti, chocolate truffles, peppermint melts, canned goods made from my garden and I will be adding my homemade basil pesto cheese biscuits to the basket. 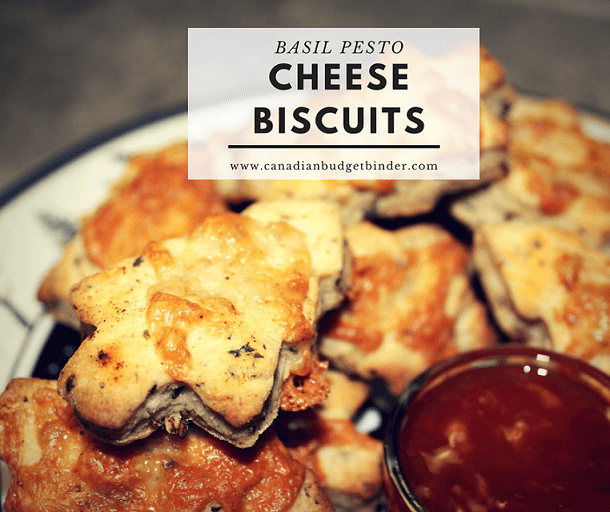 The basil pesto cheese biscuit is light and full-flavoured with a crispy cheese topping that pairs well with my sweet and sour red pepper sauce. It doesn’t have to have a spread or a sauce either it’s so good to eat with pasta and dipped in stews. If you want to enjoy them one or two at a time you’ll be thrilled to learn that the basil pesto cheese biscuits get four stars for being able to freeze well. Remove from the freezer and easily re-heat them in the oven for those last-minute guests that tend to pop around this time of year. 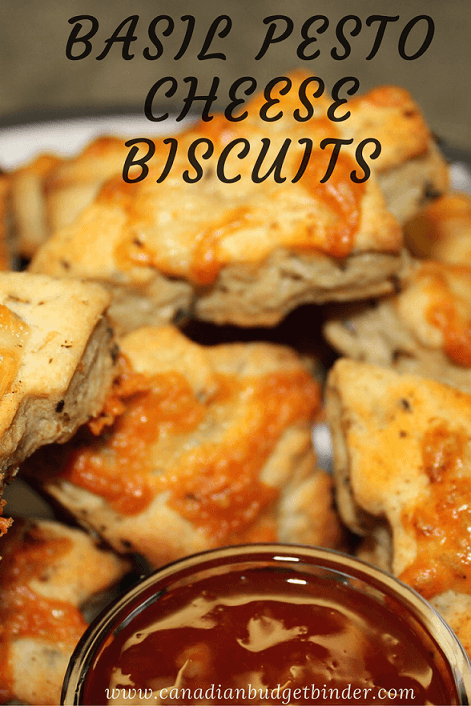 Basil Pesto Cheese Biscuits is one of those recipes that’s quick, easy and bakes in under 12 minutes. They are a great addition to anyone’s menu plan. 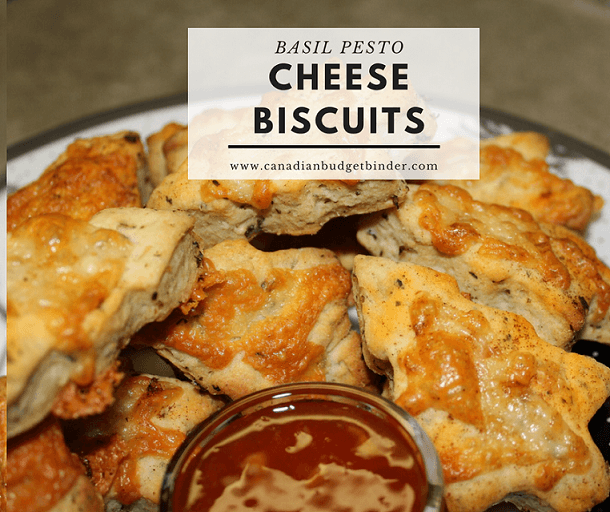 Basil Pesto Cheese Biscuits are simple to make, freeze well and are perfect for unexpected company or just to enjoy as a snack with your favourite topping. Mix flour, baking powder, cream of tartar and onion salt until well combined. Cut in shortening and basil pesto until it looks like fine breadcrumbs. Stir in just enough milk so dough leaves side of bowl and forms a ball. These gorgeous basil pesto cheese biscuits can be served straight from the oven slathered with butter. If you’re in the mood for something that tastes like it was made in a bakery, try this recipe. This is one of those recipes that will impress the guests and it took you so little time to make lol! Looks so delicious, Nicola! Will definitely have this in New Year’s food list.